Over the last decade, nearly 200,000 children have been adopted into the United States, 25,000 of whom came from Guatemala. 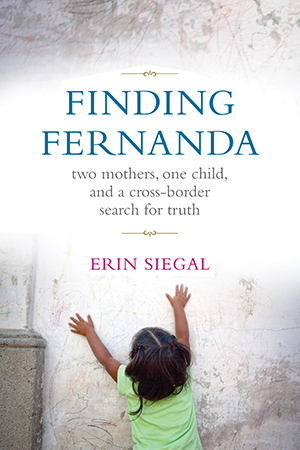 Finding Fernanda, a dramatic true story paired with investigative reporting, tells the side-by-side tales of an American woman who adopted a two-year-old girl from Guatemala and the birth mother whose two children were stolen from her. Each woman gradually comes to realize her role in what was one of Guatemala’s most profitable black-market industries: the buying and selling of children for international adoption. Finding Fernanda is an overdue, unprecedented look at adoption corruption—and a poignant, riveting human story about the power of hope, faith, and determination. The first time I set foot in Guatemala was December 2007. My sister and I were visited the country as tourists, wandering to the usual places of interest: the teeming markets of Chichicastenango, Antigua’s famous cathedral, the beautiful National Palace. At the trip’s end, we waited for our flight home in Guatemala City’s gleaming, modern airport, surrounded by over a dozen American couples. Each pair was leaving the country with a Guatemalan child. Certainly, I thought, trafficking and kidnapping problems from almost a decade earlier would be cleaned up by now. But as I continued reading press clips from 2006 and 2007, the same transgressions kept popping up. Babies were taken, by force or coercion. Birth mothers, largely disempowered, were tricked or paid. Photographing a straightforward human-interest piece no longer seemed appropriate. In fact, the issue felt better suited to detective work than to visual storytelling. In spring 2008, I applied to the Stabile Center for Investigative Reporting at Columbia University’s Graduate School of Journalism, pitching an examination of adoption fraud in Guatemala as a potential thesis topic. By August 2008, I was one of a dozen Stabile fellows receiving specialized training in investigative reporting. Some of the reporting contained in this book began at Columbia under the guidance of Stabile Center director Sheila Coronel and veteran investigative journalist Wayne Barrett, who was my advisor. At first, the project seemed to be a dry kind of historical documentation, tracking legislative evolution and lobbying efforts. I wasn’t sure how my own reporting would effectively serve the public interest, since I couldn’t imagine anyone being interested enough to actually read through such dense subject material. I asked Wayne repeatedly if I should change subjects. He told me to keep digging, and I did. I was instantly curious. That same afternoon, I sent Betsy an email explaining that I was a graduate student researching adoption and asking if she’d feel comfortable sharing her experience with me. She responded vaguely, saying she’d had four great adoptions and then a “nightmare” with a Florida agency that she “would not recommend.” She didn’t provide additional details. I asked if we could set up a time to speak on the phone. “I don’t have a lot of spare time,” she responded. “But if I can help you, I’ll try. I have a daughter who’ll be in grad school soon. “She mentioned that she knew it was hard to get people to “take the time to share information.” I expected a brief, ten-minute phone call. That day, when Betsy Emanuel first recounted her experience with the Florida-based adoption agency Celebrate Children International to me, the story seemed too strange to be true. Afterwards, Betsy e-mailed me a few articles from Guatemalan news-papers that supported her account, involving a young woman named Mildred Alvarado and her children. A week later after our first conversation, I left the U.S. on the first of what would be multiple month long reporting trips to Guatemala City. Although I planned to do general research, speaking to a variety of diverse sources, Betsy’s complicated story remained in the back of my mind. I decided that I’d start looking into what had really transpired if, and only if, I could find Mildred Alvarado without too much work. I found her within days.